I'd tell you that online shopping is one of my absolute favourite things in the whole wide world, but I guess you've already have that figured out about me, no? Instead, I spent this Sunday afternoon manically going through my ASOS saved list in order to decide how I'm gonna spend the 25% off everything coupon that's valid up until Monday December 16th, 8am GMT - that's 10am in Athens. Oh yeah, ASOS is offering a frickin 25% off the whole site, just before the holidays, no biggie. To see how calm I am, I managed to cram 21 dresses in this post. See? Really calm and focused and, oh-my-god, I don't think I can do this, I WANT EVERYTHING. 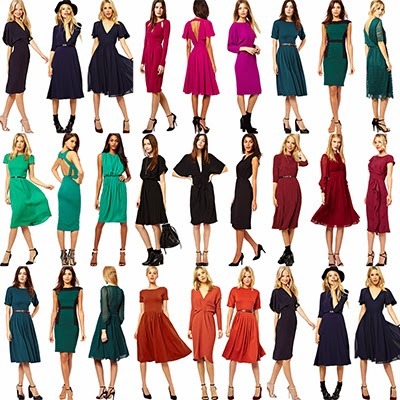 I've selected three of each colour, all in midi length. A girl has to have rules, right? BTW, all prices are original, the 25% off is extra. Which ones are the winners? Amber is a nice way to say "the kind of orange you can wear in winter". I've already bought the first one, and I'm seriously considering buying in other colours as well. Considering it will cost someting like 24€ with the coupon, it does sound like a bargain. Ok, I confess I have also bought the right one in grey. I think will make a great investment in black too, as one of those LBDs that's not too "L" and can be worn all seasons. Well, you already know all about my love for green dresses, right? I never thought I'd like such a loud and girly colour, but I do. It's a great alternative for those times that red just seems too cliché. A great alternative for when black just seems too depressing and everything else feels obnoxious. And the fabric and sleeves on the first one are making me weak in the knees. What, you thought I'd be over with justone shade of green? These babies are great for someone who looks best in cool hues, but doesn't want to look blunt. I couldn't leave red left out. However, I also wanted to point out that red isn't just one colour: Cherry, oxblood, burgundy, ruby, maroon, carmine are shades that are subtle and elegant, and can be worn by anyone afraid of the candy apple in-your-face hues. So, in case you haven't been paying attention and went on a full blown oh look at all the pretty dresses salivating mode, the fact remains: ASOS will run its 25% off offer up until Monday morning. Which ones will make it? so, which did you go for ? i like the second in the emerald greens, the blue and the dark red ones.